Police Academy 6: City Under Siege is a 1989 comedy crime film starring Bubba Smith, David Graf and Michael Winslow. It was directed by Peter Bonerz and written by Stephen Curwick, based on characters created by Neal Israel and Pat Proft. The film was given a PG rating for violence and language. 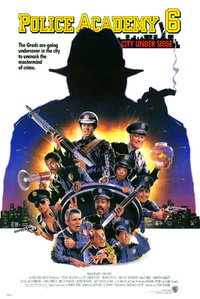 This was the last Police Academy sequel to be released in the year immediately following the previous installment of the series, as well as the last movie in the franchise to feature Bubba Smith, Marion Ramsey, Bruce Mahler, Lance Kinsey and George R. Robertson as Hightower, Hooks, Fackler, Proctor and Chief Hurst respectively. This webpage uses material from the Wikipedia article "Police_Academy_6%3A_City_Under_Siege" and is licensed under the GNU Free Documentation License. Reality TV World is not responsible for any errors or omissions the Wikipedia article may contain.